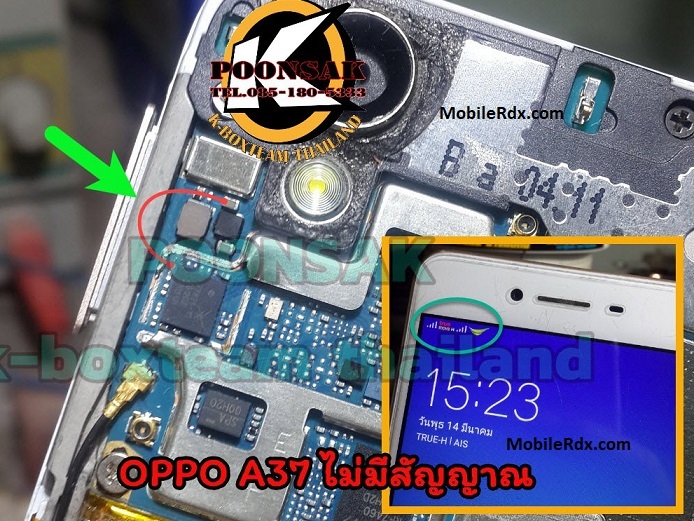 Here’s the solution that may possibly help fix and repair Oppo A37 Network Problem. Before you may proceed to use this solution, ensure that the device firmware is okay, restored and already flashed and or updated. This solution may only work if the device suffered a water damaged or heavily dropped by the user. GSM antenna contact may be rusted bay or could have found some kind of powder. Restart your phone and Oppo A37 check. Ensure that the device firmware is okay or successfully restored or flashed. Try to upgrade to a higher version and write good flash files. IF the firmware calibration already was done but seems nothing happens you may proceed to trace, check or replace the corresponding components showed on the solution above. Make sure that the PCB board condition is still stable and not like bent or some damaged spots. Check also if there is oxidation build up, clean it first before you may proceed. First, check the PA supply voltage, this voltage is coming from the antenna terminal and you can trace it between capacitors showed on the solution above.